MVM Entertainment brings us another ‘Zero’ title but this time it is The Grimoire of Zero – The Complete Collection on Blu-Ray; so let’s take a look at what we can expect from this magical filled world with beasts and mages. Like most Beastfallen, the half-tiger known as Mercenary hates the witches who created them, so when he’s offered a chance to hunt witches, he quickly agrees. But things go spectacularly wrong when he’s rescued by a witch instead and she wants him to become her bodyguard! 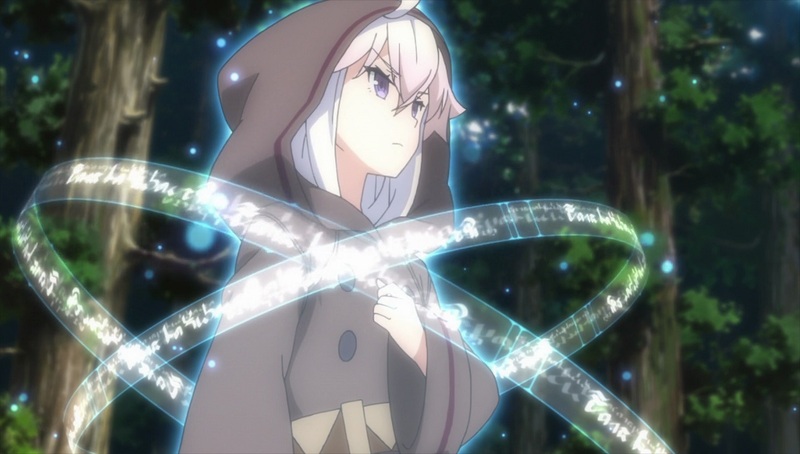 Making matters worse, she’s seeking a missing book, the Grimoire of Zero, which contains the secrets of Magic, which could possibly end the world if it falls into the wrong hands. And the author of the book? Zero herself! Worst of all, Zero actually seems to think that Mercenary is cute and cuddly, and wants to do terribly inappropriate things with him! 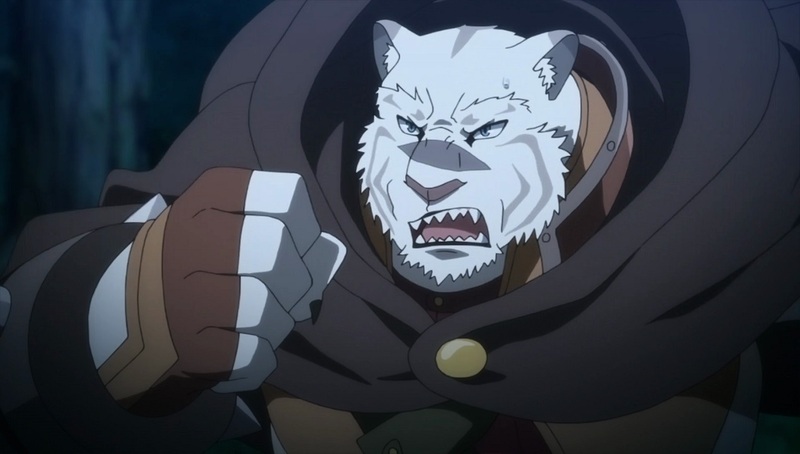 But, if he does as she asks, Zero promises to make Mercenary human, and with that reward in mind, there isn’t much that he won’t do to help retrieve the Grimoire of Zero! 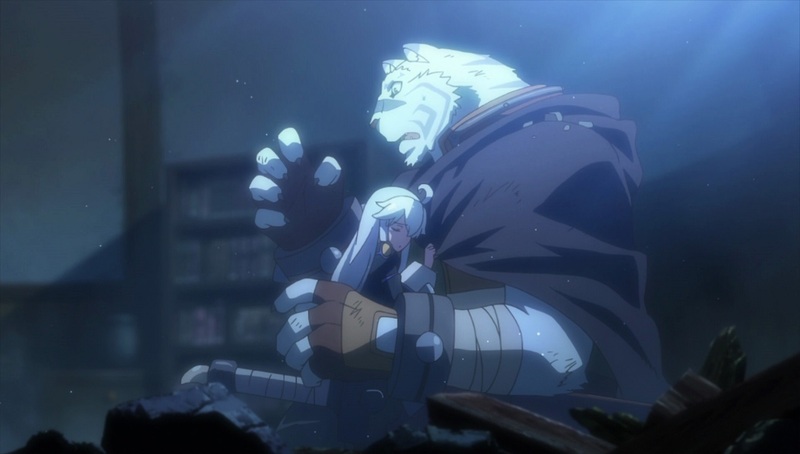 Adapted from Kakeru Kobashiri’s light novel series of the same name The Grimoire of Zero is an anime that follows the unlikely friendship between Witch and Mercenary as they work with one another to save a kingdom from destruction. It’s an unlikely relationship that works exceedingly well but unfortunately the same cannot be said for the story which sees very little development until the final selection of episodes. One lingering impression is that it sets itself up to be a potentially long-running-series that is cut short down into a twelve episode runtime. Whether or not this is intentional is unknown but it does cause an abnormal flow to the story with once thought enemies becoming allies and bonds of friendship formed through rather a strange scenarios. Confused? Well let’s start at the beginning. 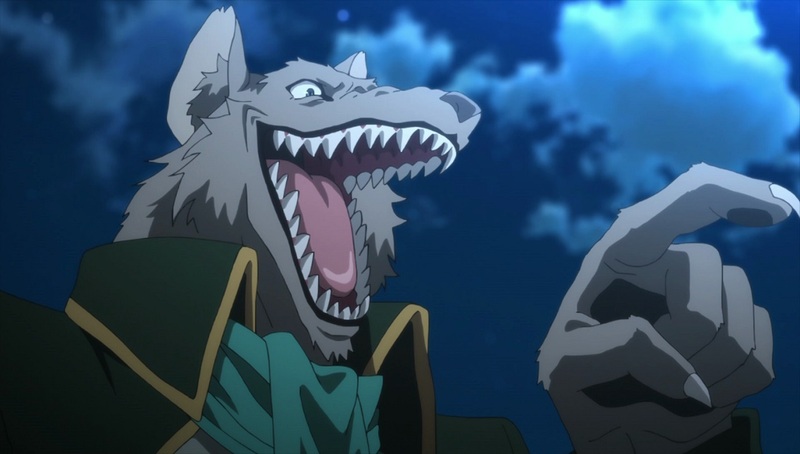 The Grimoire of Zero follows the unlikely partnership between the Mercenary, who is simply known as Mercenary, and the witch Zero. This partnership begins when the mercernary, who happens to be a Beastfallen – a human born as a beast as a result of magic usage within the kingdom – encounters the Witch known as Zero during a break from his travels. As a result of some rather comical banter between the two characters the Mercenary agrees to protect the witch on her travels; with her goal being to locate a spell book known as the Grimoire. 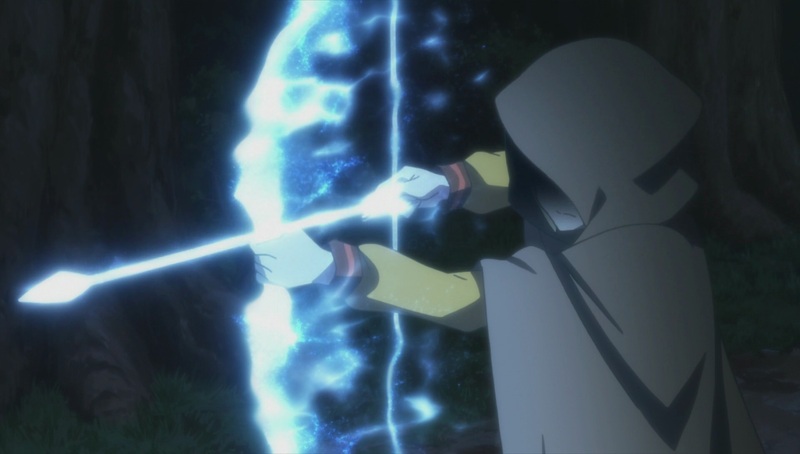 It’s explained that someone known as ‘thirteen’ stole the grimoire and if in the wrong hands can be used to cause destruction within the kingdom. Using this as a pretence for the story the Mercenary and Zero travel throughout to kingdom in order to find clues as to thirteen’s whereabouts; but along the way encounter Albus, a magic wielding who has been taught portions of Zero’s Grimoire. The Mercenary and Zero learn that the leader of his group had used the grimoire to teach people the joys of magic; and alas the group join forces to help find the secret base of these wielders in hopes of returning the book to its rightful owner as well as demonstrating to the kingdom that not all witches are bad. Unfortunately for Zero & Mercenary this is where things take an interesting turn; as upon arrival at the hidden base it is revealed that some sort of battle between mages and sorcers (apparently there is a difference) and that the book has disappeared but after soon discovering this fact they are whisked away by a magic to the depths of kingdoms capital. This interesting turns reveals that thirteen is working as the sorcerer of the state in an attempt to destroy all magicians within the kingdom. Several episodes, and several encounters later, it’s explained that thirteen – a protector of Zero during her childhood days – was manipulating both humans and those with magical power in order to adhere to Zero’s wishes; a world filled with magic and peace. Alas upon realising his wrong doings the once thought enemies become allies and they work together to stop the impending war between Humans, Beastfallen, Sorcerors and Magicians – a war created by Thirteen and his misconception of Zero’s dream. 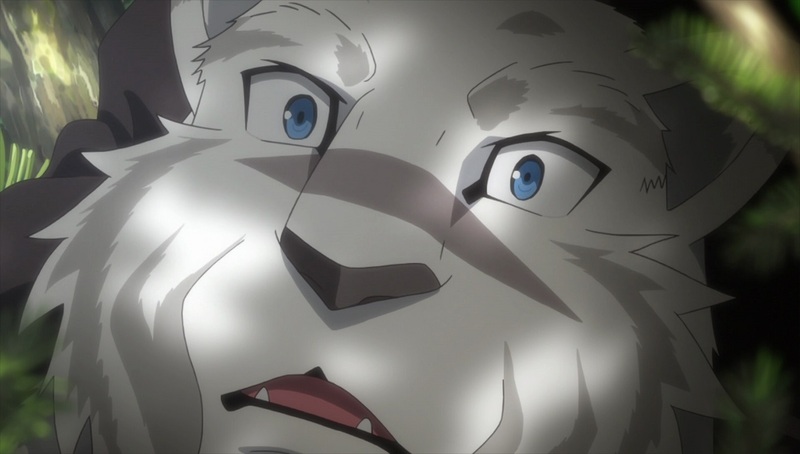 There is more to The Grimoire of Zero than just Zero, Albus and the Mercenary on a journey of locating the grimoire – which is quickly brought to a halt when summoned to the capital of the kingdom – as we also have some self-discovery for the main characters and backstories to characters that are actually dead. Sorena for instance was a goodhearted witch before being burned at the stake for crimes she did not commit and the connections she has to both Albus and another Wolf-Man styled beastfallen are constantly brought up and explained. In reality a quick overview would have sufficed but the director of this anime chose to adapt it fully to give fans the complete experience within a short time frame. 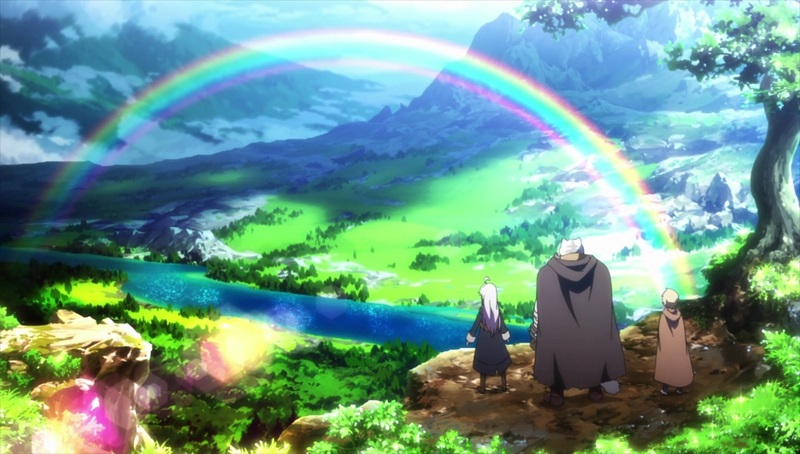 In retrospect this is what The Grimoire of Zero does really well; by flushing out the character personalities and the development of the character through a selection of different episodes and by the final episode we see that the characters has evolved and become better people. Whether it be Zero who has a ‘robot like approach to life’ or the Mercenary and has seemingly cold personality towards witches; they all grow out of the sterotypes you would expect and soon enough you’ll start to care about what happens to them. Unfortunately the same cannot be said for the development of the story as while it is a decent story it feels quietly rushed and a bit spontaneous at times; but at the same time it is a thoroughly enjoyable series that is easily bingewatched due to how the episodes seemingly connect with one another. Stay for the characters and enjoy the evolution of the story; but its a shame that we won’t see more of these characters in action anytime soon. As with most Sentai Filmwork authored releases the selection of supplementary content is minimal; but in this case we do receive the added bonus of original Japanese promotional materials that were used to promote the series on TV, Blu-Ray and DVD in Japan. This is of course in addition to the textless opening and closing animations of the show; each of which have their own unique animation style. 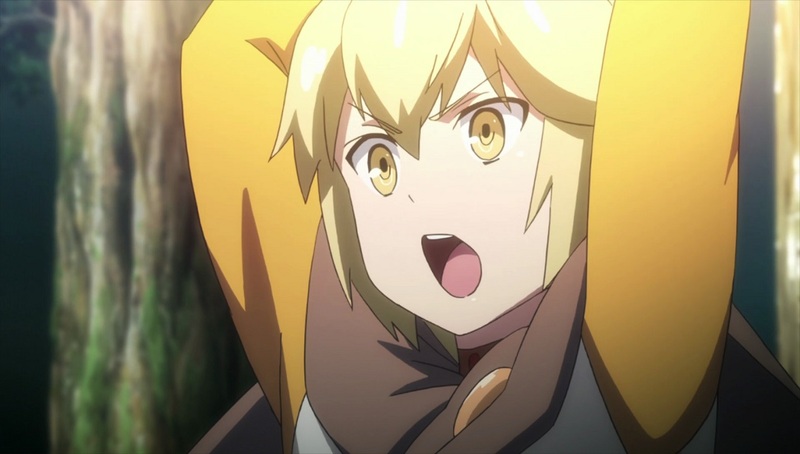 The remaining bonus content is a selection of trailers for other Sentai Filmwork licensed shows with Log Horizon, Flying Witch, Beyond the Boundary and Flip Flappers being included. As usual these are just the opening song overlayed with different scenes from the anime. It’s worth noting that Log Horizon and Flip Flappers are available on DVD and Blu-Ray via MVM Entertainment while Beyond The Boundary is available on DVD and Blu-Ray via Manga Entertainment. Flying Witch has, at the time of writing, yet to receive a UK release. 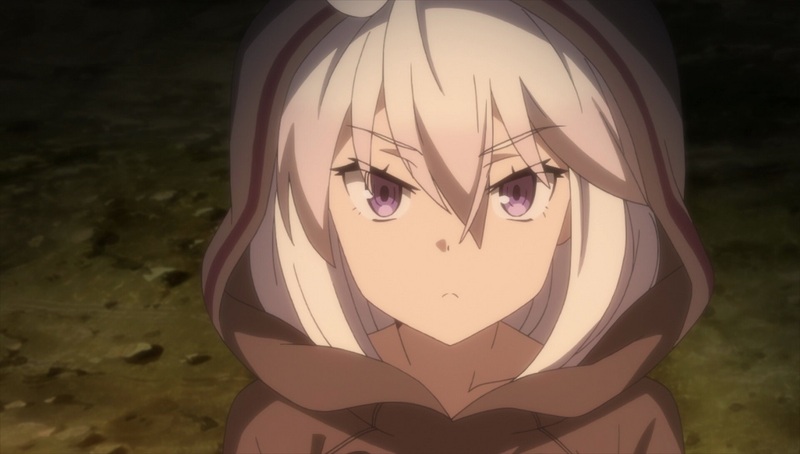 The Grimoire of Zero is entertaining series with a small lovable cast of characters that ends all too soon in a rather unimaginative fashion. What builds itself up to be good versus evil magic wielders, with humans standing in the middle, soon turns into a group of people erasing magic from existence in order to create a peaceful world. An unusual approach may be but the disappointment isn’t this; but its how it got her with allies becoming enemies and then allies again and misconception between allies results in friends. A bit confusing some might say but at least it relatively explains itself well. 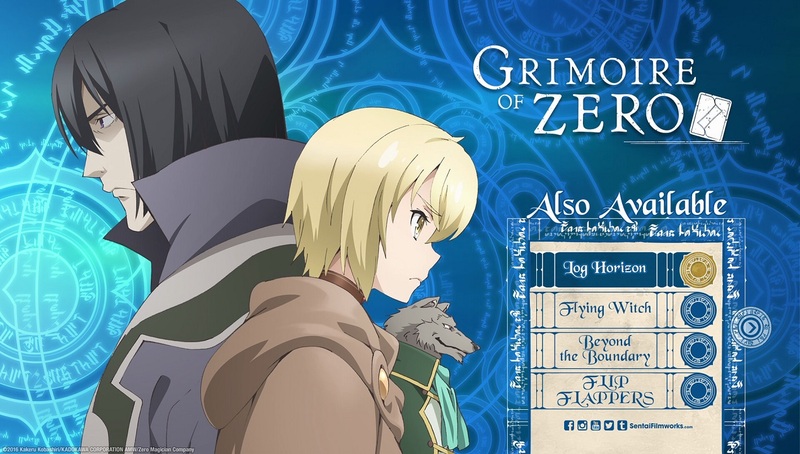 In this case The Grimoire of Zero follows the adventure of Zero, a witch who has been living in a cave her entire life, and Mercenary, a beastfallen who turned mercenary in order to hunt and kill witches, as they join forces alongside Albus, a magic wielder of some kind, in order to locate, find and potentially destroy the Grimoire of Zero. As a result of this journey the group learn the hardships that people have to go through as a result of magic being used for self-purpose as well as the threat of imprending war between the self-righteous group of witches and the kingdom’s soldiers of humans. Beastfallen meanwhile are thrown into the mix in order to defeat witches; but oddly enough we do not see on this on screen other than three particular moments outside the norm. This journey leads Zero, Mercenary and Albus to learn the truth behind the uprising in magic users and it all revolves around the once former protector and mentor known as Thirteen. Through several long-winded explanations (and numerous episodes) Thirteen is the mastermind between both the armies hatred towards witches and the uprising within the witches; a war to eradicate each force in order to create a peaceful work that Zero can potentially rule; but alas Zero just wants a world of peace between the different groups to which upon realising this Thirteen, and his powerless against Zero, he agrees to help them in their quest of erasing magic from the kingdom; and potentially the world. In an interesting story indeed; but as mentioned a rather abnormal and not as expected ended. Fortunately for us this Blu-Ray release by MVM Entertainment is as expected and retains all of the high quality aspects one might expect from both a Blu-Ray and Sentai Filmworks mastered release. In this case English and Japanese audio options are provided (with the English dub being reasonably good for a change) while English subtitles are presented in clear Yellow text with translations and double-dialogue sections in White. Simplistic, Easy and a pleasure to watch. 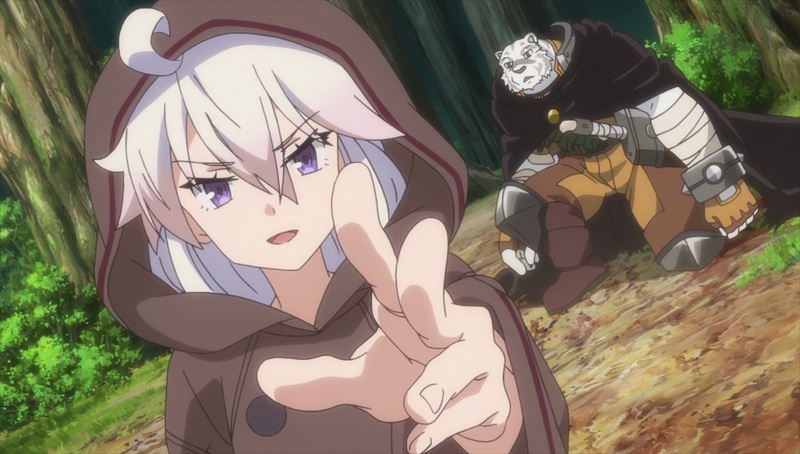 The Grimoire of Zero is not related to The Familiar of Zero; but with its comical banter and interesting characters it does offer a similar vibe and as such if you enjoyed the aforementioned series then you’ll most likely enjoy what The Grimoire of Zero has to offer – even if magic usage is abit limited. No matter; its still a show worth checking out. The Grimoire of Zero – The Complete Collection is now available as a Collector’s Edition Blu-Ray while a Standard Edition Blu-Ray will be released a later date.